Playing the CD version of the record right know, I'm reminded that it was a wise choice. Maybe the sound quality wasn't the best, but what did it matter. This was Elvis' historical U.S.S. 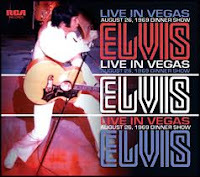 Memorial benefit concert, showing just how good Elvis sounded live in the early sixties and at the same time serving as a reminder of what could have been, had Elvis continued doing concerts through the sixties. As it turned out, the benefit concert performed on March 25, 1961, marked the last of only three live performances (the other two took place in Memphis a month earlier) Elvis did in the early sixties. He wouldn't return to the stage in another eight and a half years (not counting the live recordings done for his NBC TV Special in 1968). The repertoire that day, exactly 50 years ago, was an exciting one, with about two thirds of the material from Elvis' pre-army days and the rest from his then current catalog. And unlike some of his concerts some ten or fifteen years later, he treated each and every song with the same respect. In fact, he delivered songs like "Heartbreak Hotel" and "One Night" much the same way as he had in the 50's. But I thought then (listening to the LP), as I do now (listening to the CD), that the most exciting part was Elvis singing his recent songs, such as "Reconsider Baby" (featuring an incredible sax solo by Boots Randolph) and "Such A Night." He even sang "Swing Down Sweet Chariot" from his religious album His Hand In Mine. All in all, Elvis was in top form that night, full of energy and humor and with a great playing band behind him. To Boots Randolph it was "one of the highlights" of his life, according to Peter Guralnick's book Careless Love. I'm sure glad the tape of the show survived. Be sure to check out Troy's post The Pacific War Memorial Commission Proudly Presents In Person: Elvis Presley (The Mystery Train Elvis Blog) that inspired me to listen to An Early Benefit Performance. Having worked as a journalist for ten years I'm used to asking the questions, not answering them. But recently I had to do just that, when I was interviewed by the editor of the official news magazine for the university where I'm currently holding a position as a public relations officer. As I wrote a couple of months ago, the editor asked me if I wanted to be portrayed in the magazine under the headline In my spare time. About a week ago, he paid me a visit at home together with a photographer. At first, he didn't look too impressed, not finding a single room solely dedicated to Elvis. But when he left about an hour and a half later, he was deeply affected. The interview took place in the living room where I have my record collection and my books. Pretty soon I found myself answering questions like, "When did your interest for Elvis start?" "Is it just the music you like about him?" and "You say that you experience something that has to do with Elvis practically every day, how is that possible?" At first I thought carefully about my answers, but then I just kept pouring my heart out. After all, it's not every day someone wants to know all there is about your biggest hobby. 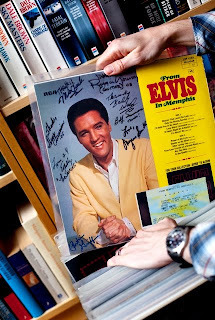 So I talked about my love for Elvis' music and my interest in learning more about him as a person, played records and tried to get my points across. The editor scribbled for dear life on his notepad. The whole thing ended with the photographer asking me to leaf through some of my LP records, which I obedienlty did, feeling a bit silly as his flashes went off. A couple of days later I got a call from the editor, thanking me for an interesting evening. He also told me that it would take a while to finish the article, because of all my lengthy answers. So I guess I have to wait a while until I'll see the final result. The photographer was faster. Almost immediately he sent me the shots that will accompany the article. I thought they were pretty good, here's for hoping the article will be as well. Turned out I was wrong. Promised Land isn't going to be the next in line to get the FTD classic album treatment. That honor will instead go to another "what if" album, called Elvis Sings Guitar Man. 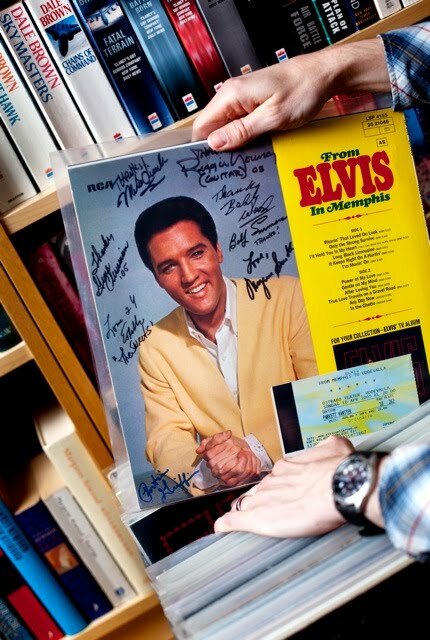 Just like Elvis Sings Memphis, Tennesee it will include songs recorded in Nashville, this time from the period 1966-67. Actually, I wasn't completely off the mark, as it was one of eleven titles I thought was left to be announced in the Classic Album series. The only difference is that my "what if" album featured the four Nashville tracks recorded in 1968 as well. Where FTD will include "Too Much Monkey Business," "U.S. Mail," Goin' Home" and "Stay Away" now is anybody's guess. That said, it looks like a nice release, with a cool pick of Elvis from the movie Clambake on a cover that is done in a 60's retro style. Speaking of Clambake, four of the songs found on Elvis Sings Guitar Man ended up as bonus songs on the soundtrack album, including the title track. Something I recently covered in a guest blog over at The Mystery Train Elvis Blog. 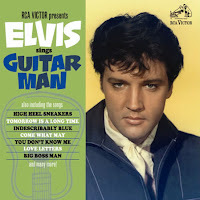 Elvis Sings Guitar Man will be released in April, at the same time as Live in LA, a CD originally part of the book/CD combo with the same name. Turned out I was right about that one.